What Do You Think of Katniss' Wedding Dress? 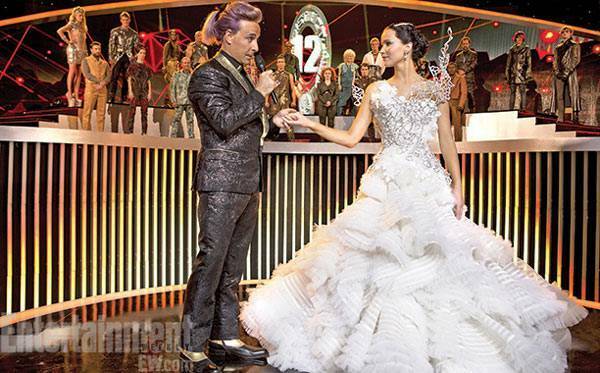 What Do You Think of Katniss’ Wedding Dress? We had a peek at Katniss’ wedding dress earlier in the year when a publicity shot was released showing the victor in her gown, but we now have an actual still of an in-character Jennifer Lawrence wearing it on set. If I’m not very much mistaken, this is Katniss’ reintroduction to the citizens of the Capitol, right before Peeta shocks the world with another interview info-bomb. The dress is a customized version of a gown from Jakarta designer Tex Saverio’s 2012 bridal line. It features an organza corset covered in Swarovski-crystals and adorned with two large, wing-like embellishments that rise above a voluminous skirt of organza and chiffon. The dress in the photo above has a tight waist but is notably missing pearls, sleeves, heavy silk, a crown, a veil, and a low neckline. It’s hard to imagine Katniss moving much in it at all, let alone twirling long enough for the dress to transform. What do you think? Is the dress true enough to the spirit of the book that you forgive it for not matching the text’s description, or do you think costume designer Trish Summerville should have stayed closer to Suzanne Collins’ description of Cinna’s design? If you’d like to have some fun imagining what could have been, check out these drawings of potential dresses that several designers sketched for Katniss before the final dress was revealed. Sources: Entertainment Weekly, Bridal Guide, Cinema Blend.